This Obstacle Course Goes Almost Anywhere! That's right! 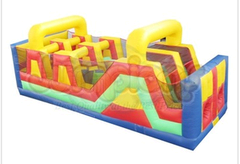 This backyard obstacle is perfect for family picnics, birthday parties, or anywhere space is a consideration. 30ft long with dual lanes, it creates a fun family style challenge. Brightly colored and large enough to impress even the most discerning of your guests.